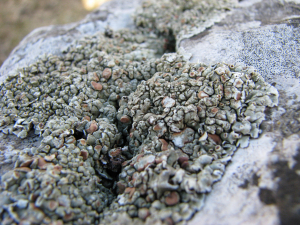 Observation - Grey-green lichen on limestone - UK and Ireland. Description: Grey-green crowded squamules growing in joint on limestone pavement. White pruinose coating on squamules. Lots of apothecia with red-brown discs. Smaller, younger apothecia show light coloured margins. Possibly Squamarina cartilaginea. Grey-green crowded squamules growing in joint on limestone pavement. White pruinose coating on squamules. Lots of apothecia with red-brown discs. Smaller, younger apothecia show light coloured margins. Possibly Squamarina cartilaginea.